So this is it. The last week of the Fall 2016 Sunday Long Run Season. Some ran marathons last week, others are out running the Chicago Marathon or the Mohawk Hudson Marathon this weekend, and a few have one more week to go before Baystate. For the latter, this week we run a short, easy 12 miler to keep those legs moving but not overtax them. This is your taper, a time to keep the feel of the pace but cut the mileage way back to let those muscles recover for the big day. I like to call it “Don’t do anything stupid week”. When you’re about to do anything physical, pause and ask yourself “is this stupid”. Who: Lois will handle this weeks run because I’m heading back up to Maine. The rest of you will run it. How: It’s a simple route this week, you’ve done it a handful of times this season in one form or another. 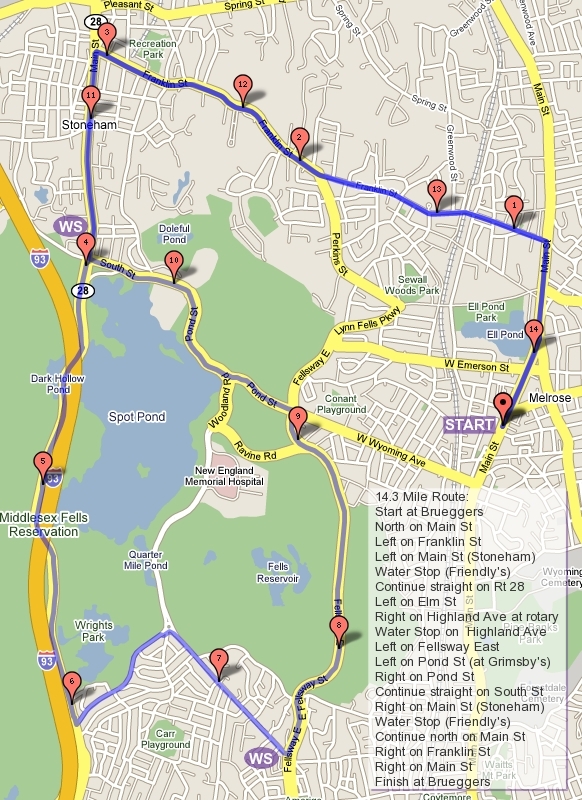 Head up past Ell Pond, ask Clarence DeMar for some marathoning mojo, turn left on Melrose Street, and left again to get onto the LynnFells Parkway. Follow that past Grimsby’s onto the Fellsway East. Through the hills, and a right turn onto Highland will bring you to the first water stop. Whether you’re running short or long, this week everyone goes straight through the rotary and past Flynn Rink. Short will turn right at Pond Street, continue past Grimsby’s on to West Wyoming, turn left on Main and finish up a 7 mile run. Longer runners will continue a counterclockwise loop around Spot Pond, past the zoo, cut left through the Straw Point parking lot, left onto the Fellsway West, around the back side of the pond, left on Elm Street and back up to the rotary near Flynn Rink. Turn right onto Highland and stop again for water. Take a left onto East Border Road and a left at the lights back on to Fellsway East. When you get to Grimsby’s turn right onto West Wyoming and then finish up with a left on Main Street and you are done. Fully prepared for Baystate. Water Stops: One stop should do it, but if another helper comes along there’s a little sip at Straw Point people might appreciate. Also, keep your ears open for a post marathon season brunch. Sometimes we have them, sometimes we don’t. If someone wants to host, let me know and I’ll help coordinate it. How (much) : $1 for short, $2 for long, plus $1/gu after your first. What : About 15 for marathoners, 7 for halfers. Where: Starting and ending at Brueggers. How: You’ll head up East Foster to the Melrose Common. Right on 6th Street, straight on to Swain’s Pond Ave. Right at the stop sign by the ponds to stay on Swain’s Pond. Right on Lebanon and a left at the lights on to Forest. Cross Main Street to the Citizens Bank parking lot for water stop 1. After that you’ll continue on to Winter Street, passing Oak Grove MBTA Station, and crossing straight through an intersection to Glenwood Street. Keep on moving through the twisty and turny hills until you come out to Highland Ave. Turn right and a few steps later another right to put you on to the Fellsway East. Take those hills to Grimsby’s. If you’re running short turn right onto West Wyoming, left on Main and finish for an easy recovery 7.1 miles. If you’re running long keep on going straight past Grimsby’s onto the LynnFells Parkway. You’ll find a water stop at the knoll across from Melrose High School. Continue on LynnFells Parkway past the lights at Main Street in Melrose, lights at Green Street, to the lights at Main Street in Saugus. Turn left there, and follow Main Street, which will become Farm Street until you come to Nahant Street, across from Wakefield High School. Turn left on Nahant and a mile later you’ll be at Main Street in Wakefield. Stop at Nick’s Pizza parking lot for another water stop. Head down Main Street back into Melrose and finish up at Brueggers 15 miles closer to a marathon. Water Stops: I’ll be driving to Maine while you’re out running so Lois will be coordinating water stops. Two people will get the job done: one at Citizens Bank then Nicks Pizza, the other at the Melrose High knoll stop. Who’s helping? Who: Let us know who’s running so we’ll have supplies for you. Roll Call!